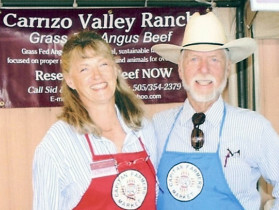 Sid and Cheryl Goodloe began implementing what was to become Holistic Planned Grazing in the late 1960s. After learning about the technique in Africa, Sid returned to Carrizo Valley Ranch in 1969 and began to divide paddocks, not using the cell approach, but by topography and water availability, and began noticing a general improvement in range condition and biodiversity. Sid’s primary goal was to grow as much grass as the rain would allow and control erosion. This led to the realization that there were too many invading trees that were not only suppressing grass growth, but causing sheet and gulley erosion. It has taken 50 years to achieve that objective or goal and now the Goodloes are able to keep much of the rain that falls on the ranch—on the ranch! Riparian Area Comparison. 1958 on the left. 1998 on the right. The Goodloes have used a wide variety of vegetation manipulation methods to accomplish their landscape goal and sustain what they want to produce. They have included: chaining; dozing and piling; seeding; fire; hand grubbing; and herbicide. Their philosophy is to defer the riparian area during the growing season and flash graze during the dormant season. A lush riparian zone is also attractive to all forms of wildlife, and when combining that with uplands in near climax condition, fee hunting becomes a major player in the overall profitability of the ranch.